Description: With her Southern Railways days long gone, NS SD40-2 3259 still with her former Southern trade mark high short hood and Nathen five chime horn stand ready for the days work and many more assighnments that she will pull before retirement. 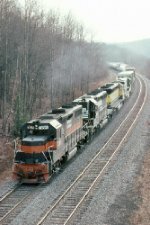 These will be a breed of units missed by not only railfans but, Former Southern employees who ran them in proud trios up and down the main lines that served the south. Description: NS local job GZ03 with the rebuilt NS GP38-2 5537 pulls south with two empty gons at 2:37PM for industries to the south it will work before calling it quits for the day. Mean while NS SD40-2s stand gaurd on both sides having completed their duteis for the day. Description: GE06 is seen south bound down the number three main passing Jefferson Street just south of King Plow at 1:55PM with SD40-2 3259 in charge with four cars bound for South Yard on the Atlanta South District. Description: NS GE06 has spotted it's four cars at South Yard and heads to put it's SD40-2 in the clear at 2:31PM. This local job will tie up here for the day and the SD40-2 will be used for other local assighnments based out of SOuth Yard over the week end. Description: A pair of NS SD40-2s, Both former Southern railway units rest awaiting their next assighnmrnts while rebuilt GP38-2 5536 has yet to complete it's work for the day. Description: A nice power lineup in South Yard. Description: Perfect place for a cooler on this rather chilly day. The Dalton Yard Job heads South to switch around Phelps. 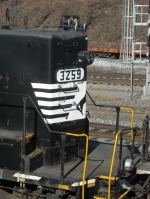 Title: NS 3259 (SD40-2) HIGH HOOD. Description: NS 3259 IN DALTON. NOTE THE EXCAVATOR ON TOP OF THE GONDOLA!!! Description: Laying over by the GS (Georgia Southern).